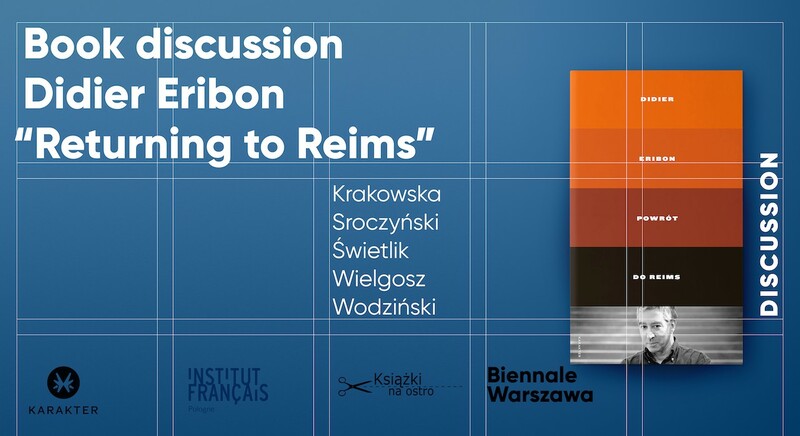 Karakter publishing house and Biennale Warszawa would like to invite you to a discussion about Didier Eribon’s book Returning to Reims translated to Polish by Maryna Ochab. Participants of the meeting moderated by Grzegorz Sroczyński, journalist and broadcaster from TOK FM radio and Gazeta.pl will include: Prof. Joanna Krakowska, theatre studies expert, professor at the Institute of Art of the Polish Academy of Sciences, Maria Świetlik, anthropologist, activist, member of the Workers’ Initiative, Przemysław Wielgosz, chief editor of the Polish edition of “Le Monde diplomatique”, Paweł Wodziński, director, curator, Biennale Warszawa director. Didier Eribon grew up in a poor working-class French family which did not accept his homosexuality. As a young man he broke off ties with his community to try and live a completely different life at any cost. After long years he returns to his family home and must confront his condition. He decides to say what he has been ashamed of all his life: he speaks about poverty, social humiliation, and exclusion. He presents the history of his upward social climb, as well as fates of his parents and relatives who, despite their attempts, did not manage to change their social status. He seeks answers to the questions: what is the situation of working class today? Why do his relatives vote for the right wing? What obstacles children from families with a low social capital must overcome? What is social recognition in practice? This book’s excellent writing facilitates understanding many of the current socio-political phenomena. Returning to Reims is also a rare example of a text in which the courage of an intimate confession and an inslightful sociological analysis coexist on equal terms. Didier Eribon (b. 1953) is a French sociologist and philosopher. He works at the univeristy of Amiens, but he lectured at numerous others, including Berkeley, Princeton, Cambridge and Valencia. Author of several dozen books on sociology, philosophy, the history of ideas and gender studies. His major works include Michel Foucault’s biography (published also in Polish), Réflexions sur la question gay; Une morale du minoritaire. Variations sur un thème de Jean Genet; La Société comme verdict. Classes, identités, trajectoires. His books published in Poland include also conversations with Georges Dumézil (published with the subtitle Tracking Indo-Europeans. Myths and epics) and Conversations with Claude Lévi-Strauss. Returning to Reims was brought to the theatrical stage several times, e.g. by Laurent Hatat and Thomas Ostermeier. Polish stage adaptation of the the book is being developed by Paweł Wodziński and Biennale Warszawa.